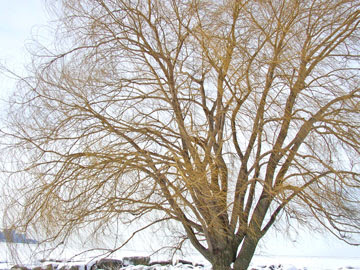 My previous post showcases the brilliant shades of color that Northeast Ohio experiences during the winter: White, gray-white, bluish white, light yellow, a few shades of brown, and so on. All joking aside, it's actually nice to be able to appreciate subtle color variations during the winter time. An admitted design eclectic, I occasionally have a yen (especially in the wintertime) for a clean, light, Scandanavian-inspired design, and NE Ohio winters give me that fix. But at this point in the season, I want color. And so I've been avidly following along with the February Garden Bloggers' Design Workshop posts on Color, brought to life by the wonderful folks over at Gardening Gone Wild. I've been wanting to "play along," so to speak, but don't particularly have an overriding color theme in my gardens. So I scrolled through photos, hoping for a post topic to come up and hit me right between the eyes. And as I looked through the many pictures of my favorite area of the garden, which I think of as "the rhododendron bed," it hit me: This area is probably my favorite because it's always changing colors and textures throughout the season. 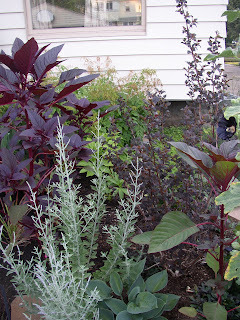 Check out the first photo, where you see the green spring foliage of Russian sage mingling with an unnamed blue hosta and emerging leaves leaves on the 'Diablo' purple ninebark. The color combo is very fresh and modern. Now look at the second picture of that same area, after the garlic has been harvested. 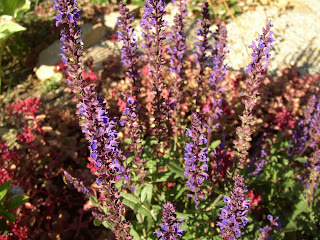 The Russian sage has turned silvery blue and the dark 'Chocolate Chip' ajuga winds below the hosta. 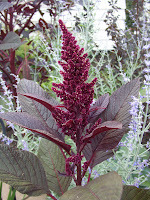 The 'Hopi Red Dye' amaranth seedlings were allowed to grow wherever they wanted, With 'The Watchman' black hollyhock providing even more dark color, this area looks positively moody. 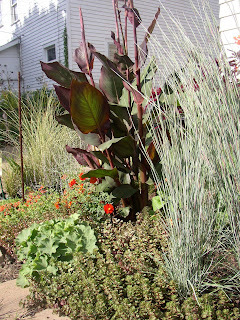 On the driveway side of this bed, other amaranth seedlings take on warm hues when backlit and surrounded by fading goatsbeard flowers, the brilliant orange blooms of canna 'Wyoming' and the warm purplish green of bronze fennel. Later in the summer, orange cosmos, more 'Hopi Red Dye' seedlings, and the red-orange flowers of zauschneria latifolia--along with 'Yubi Red' and a smaller-flowered yellow portulaca--help keep this area nice and warm. Turn the corner, though, and some of these same plants form a cooler palette with their faces in the sun. 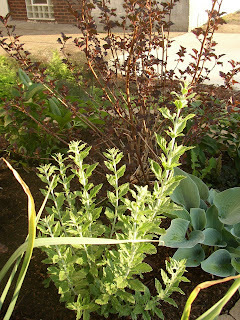 The addition of the gray/green /red foliage of 'Voodoo' sedum, fresh lady's mantle foliage (from a post-flowering cutback), more Russian sage, 'Morning Light' miscanthus and 'The Blues' little bluestem grasses frame the hotter foliage and flower colors in an interesting way. The examples above are kind of extreme in their scope... but there are smaller little vignettes that amuse me with seasonal color changes as well. 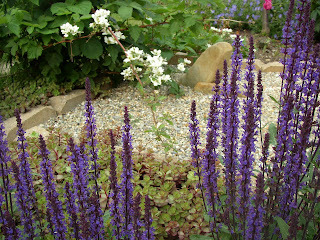 Here's a picture showing my beloved 'Caradonna' salvia (look at those gorgeous dark purple flower stems!) in May on an overcast day. The 'Fuldaglut' sedum is showing fresh green foliage with red tinges, white flowers arch over the rock garden from my rather exhuberant blackberry, and in the background you see the flowers from perennial geraniums and an inherited peony mingling. They all cool down the picture. 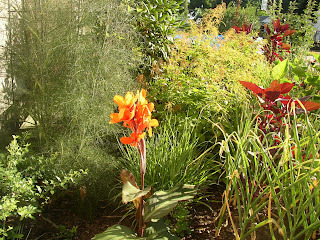 Contrast that with late July, when the sun is blazing overhead and the white and blue background flowers have been replaced with blazing sedum flowerheads and yellow-edged hosta foliage. Fading salvia flowers echo the sedum foliage color-wise, and to the right (just out of camera view) is a silver culinary sage that contributes to the hot dry beauty of this combo. Since I like so many colors (just not... you know... pink) in the garden, I guess it should be no surprise that I tend to go for plants that offer me more than one "look" throughout the season. After all, in small urban gardens like mine, every plant has to earn its place through a mixture of beauty and utility--and chameleon plants earn pretty high marks in the former subject! Over the past couple of years, Brian and I have developed the habit of "celebrating" holidays by taking scenic hikes. 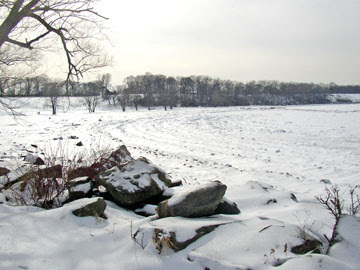 It's a perfect time to have the snippets of metropolitan wilderness that remain to ourselves... so last Thursday, when we had a few hours together on Valentine's Day afternoon, we packed up the dog and headed up to Edgewater Park. A la chuck b. who blogs at My Back 40 (Feet) I took some pictures so you could join us. Finally, to the beach. Unlike some others we saw, we respected the "No Pets On Beach" sign and simply walked around it instead of through it. I'm sure it's a hygiene/cleanliness issue to have animals on the beach, but that's a bit ironic considering this beach is often declared unsafe for swimming because of the lake water anyway. 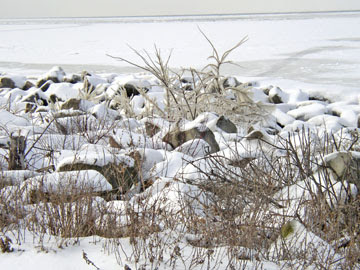 Look a little closer at the iced-over water. It looks like there are still waves here... 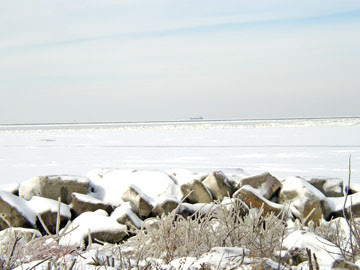 I'm thinking because of the way the water froze in sections that happen to mirror the shape of the shoreline? 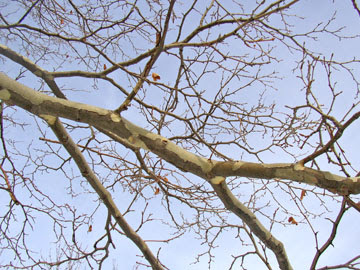 The peeling bark on its branches looked neat against the blue sky. 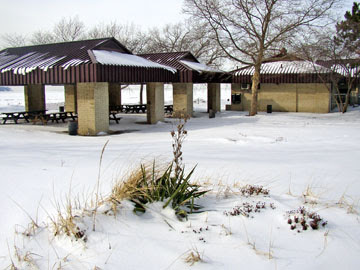 The picnic buildings are usually full in the summertime, but not so much in the winter. 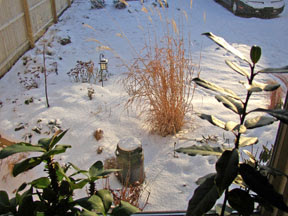 I really liked the little xeriscape bed in the foreground--hurray for winter interest in a corporate/public landscape! 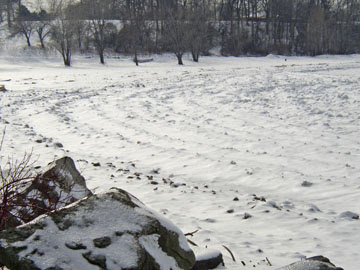 Nearer to the car, the snow had a crusty, 3/4 inch thick layer on top. We made the mistake of tossing a few sheets of this snow to Miss Coco, frisbee style... since she is a relatively tireless Lab/Malamute mix, we ended up continuing the game at her insistance for a good 15 minutes or so. 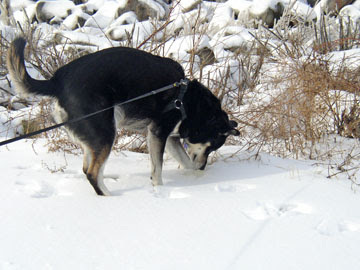 So much for the tough girl act... whenever she misses a chunk, she turns around and goes bounding through the snow looking for it. Silly dog! The game of fetch concluded our little scenic walk for the day. 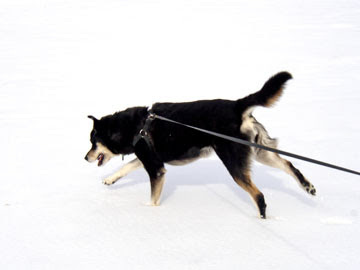 But now that I look outside I see that the skies are a similar shade of blue and the sun is shining again... maybe it's a sign that it's time to throw a harness and a leash on Coco and take another walk. 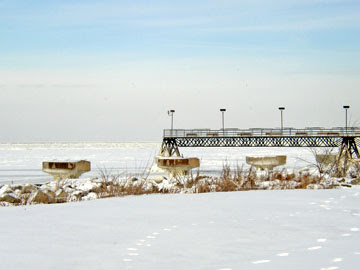 Even if it's just around the neighborhood instead of along the lakeshore. Have a wonderful weekend! My difficult relationship with the color pink has been pretty well chronicled in this blog over the past couple of years. You can imagine my dismay when I downloaded all of my February Bloom Day pictures of things in bloom and flower, and found that they all contained... pink! 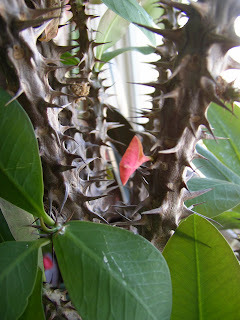 This is not technically a flower (nor is the color on the poinsettia above) but it fooled me into thinking it was, for a while... because crown of thorns does have salmon-pink flowers when it blooms. I'm glad to see this plant, euphorbia milii, putting out new leaves whatever the color. 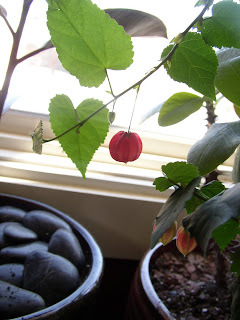 It had been stressed over the winter--I had bought it in the fall, pot-bound and on clearance--and so I gave in and repotted it a few weeks ago, even though I had wanted to wait until spring. As you can imagine, moving it to a new pot was an adventure, but one made a whole lot easier with the assistance of basic kitchen tongs. That's all from my NE Ohio garden for now. 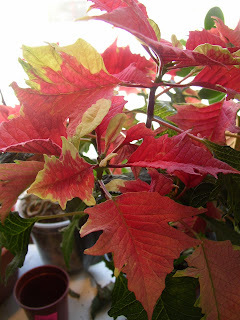 Got something in flower, bloom, bud, or winter color? Head on over to May Dreams Gardens and share your post with all the rest of us color-starved northern gardeners, please! 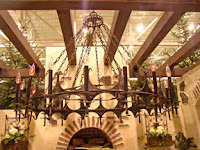 Last year, I was enchanted with the annual Cleveland Home & Garden show, as was evidenced by the fact that it inspired three separate posts in February. This year? Well... let's just say that the show left a whole lot to be desired, with a few shining exceptions. 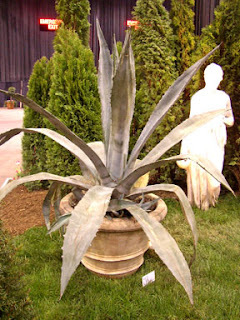 I have no idea what the price tag might have been on this huge potted agave, but suffice it to say that I was drooling over it. Usually, I would want to see it in a dark pot to show off its pale leaves, but here with a white classical statue in attendance it looks perfect in its washed out terracotta pot. Sadly, this was one of the very few nods toward Italianate style in the gardens on display. Preview articles in The Plain Dealer hyped up the importation of real Italian cypress trees to fit the theme, "Bella Italia," but in reality the vast majority of the display gardens featured plants familiar to most NE Ohio gardeners: Astilbe, hosta, coralbells, and the like. 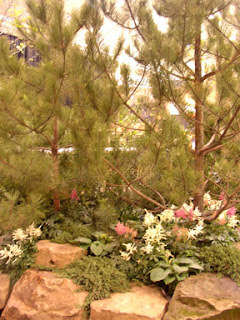 I could have taken this picture of pine-wooded loveliness at last year's show, and it would have been more believable in an Irish garden (except, of course, that thirsty plants would not really thrive in competition with the roots of pines) but it just doesn't say "Italia" to me! I found myself searching the gardens for a grapevine--or maybe a pot of lavender or rosemary--and one of those extremely formal layouts that I love to admire, just Not In My Garden. But there were none to be found. 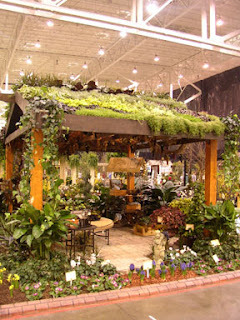 It was as if this year's show went out to prove ruthlessly what Rick from Whispering Crane Institute pointed out last year, that these display gardens are meant to sell landscaping, not really to cater to gardeners. And while I realized the truth of his words, I still longed for something to excite me as a gardener. The hyacinths smelled lovely on a cold winter day, and some of the ironwork was beautiful, too, but none of the display gardens really hooked me. Nothing enticed me to walk up some steps or peer into a "watery gateway to hell" like features in last year's gardens. And judging by the fact that it was a busy day and yet people strolled through the displays quite quickly, I'm guessing that I wasn't the only person, gardener or no, who felt this way. There was one garden, however, that made me stroll through slowly, to better absorb some of the thought that went into it. Petitti Garden Centers put together a wonderful display garden last year, complete with a "moss monster" on an arch, and this year's display was similarly wonderful. 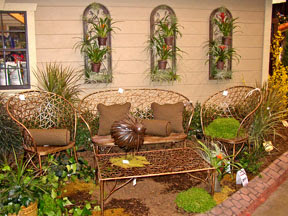 The little vignette here was not very Italian in feel, but it did include some adorable metal garden art, great use of texture, and a fun grouping of bromeliads as living artwork. Petitti's did give a few nods to the "Bella Italia" theme, however, with large urns, some gorgeous standing columns, and a grape press that was incorporated into one bed. Their piece de resistance, however, IMHO was this wonderful patio. Normally, my busy time at work is finished by the second weekend of February... but that's not true this year, I'm afraid. 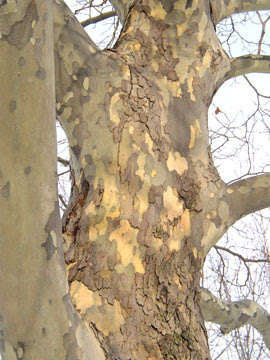 It's been a long winter in that way. 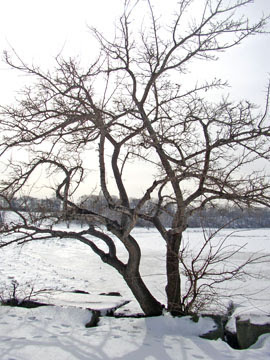 Unlike many of my fellow garden bloggers, it seems, I have been lucky enough to escape the "winter blahs," or Seasonal Affective Disorder, or whatever you want to call it. 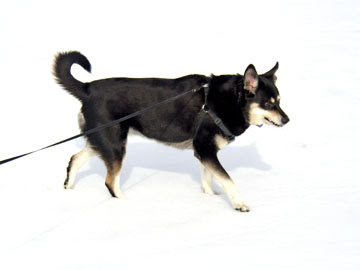 I think that my regular walks, both with and without my four-legged gardening assistant, really help. 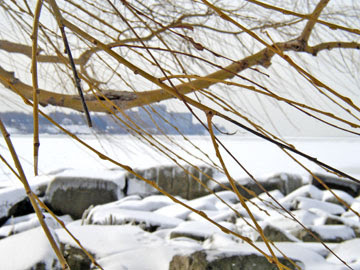 Winter seems much less oppressive when you do not feel house-bound because of it. Another thing that helps is the winter garden. 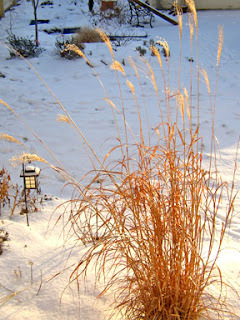 I enjoy noticing the little things, like the way the winter sunlight highlights my miscanthus 'Zebrinus' in the mornings. Yesterday, I amused myself by counting the flower buds on my three 'Ivory Prince' hellebores. (Eight!) 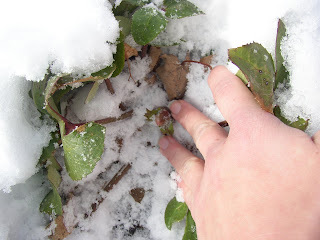 Today I trudged out to the front garden after work to lay in a few evergreen boughs (Christmas tree recycling) around the base of the Dortmund rose before tonight's temperature drop. Temps have bottomed out before, but this time we have no snowcover so I figured the rose might appreciate some extra protection. I also enjoy judging the coldness of the day by the angle at which the rhododendron leaves are drooping... and checking to see how many new kinds of birds are visiting my feeders. Unlike certain other people who shall remain nameless, I decided to declare a truce with my own resident squirrel and bought a bag of "squirrel and critter" feed at the store today. I hope that providing him his own chow will keep him from camping out (literally) on top of the platform feeder and gorging on birdseed! We'll see. 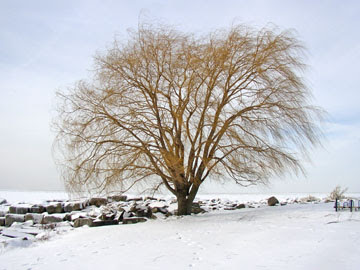 So while winter hasn't been too bad--and the long hours at work are making it go by quickly anyway--I have at least one fun thing to look forward to this spring: Seeing a Charlie-Brown-looking stick arrive in the mail and imagining it into a full-blown tree, loaded with juicy, sweet peaches, as I plant it.